At times, the combined crush of client timelines and the challenges of practically implementing innovative ideas can make life as a marketer feel like a blur. It’s fast-paced, exciting and often stressful – but that’s where good ideas come from. It’s also often the source for late-night karaoke sessions fueled by foul-tasting cinnamon liquors. The organizers of charitable organization 48in48 have somehow captured the best of what makes a life in marketing worth pursuing in its annual nonprofit hackathon. BrightWave was there for the second year in a row, and apparently, we made quite an impression. It’s an organization founded by Jeff Hilimire of Dragon Army (also a former partner of our own Raj Choudhury) and Adam Walker of Sideways8. The idea is to connect skilled marketing and technology professionals with nonprofits in order to produce 48 custom websites for 48 nonprofit organizations in 48 hours. The first 48in48 featured 150 professionals providing over $1,200,000 in donated services. This year, the Atlanta event alone boasted over 300 volunteers and the hackathon expanded to four different cities. We’re not a web shop, but we make killer emails. Most nonprofits badly underutilize email in terms of audience engagement, fundraising and event promotion. So, we committed to helping these nonprofits get more from email while the other volunteer organizations and agencies built websites. All BrightWavers involved should be proud of the fact that we accomplished our goal and every nonprofit received new tools to help operationalize their efforts via email. Nice work, team! There’s a certain beauty in chaos as it brings our problem-solving skills to the forefront. Monday before the event, the space where 48in48 was supposed to take place fell through as an acceptable venue. 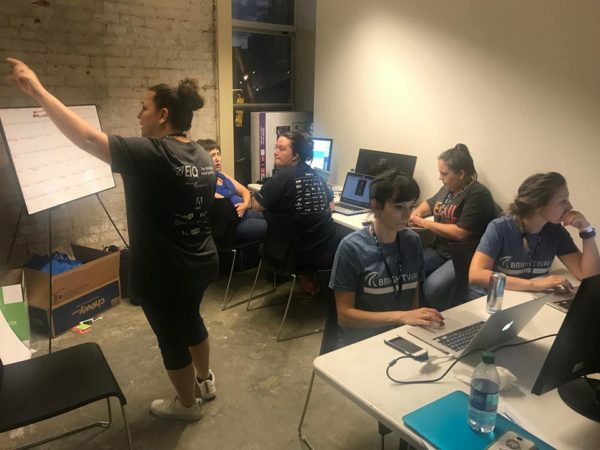 Rather than cancel, the organizers found a new space downtown in the old Beltline offices – currently occupied by the CoWorking space Post-Office. The floors were oddly sticky but the space was beautiful. It was like working in an old Victorian factory where one could imagine Absinthe being made. 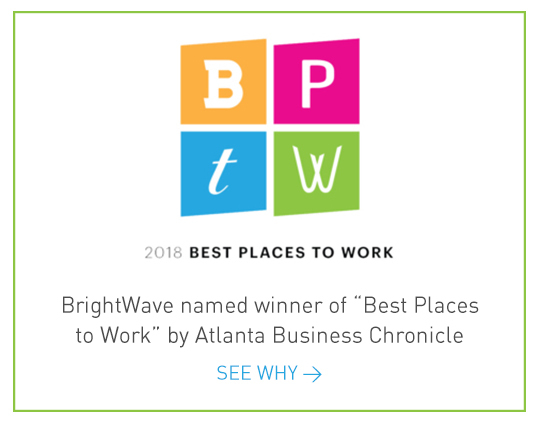 We had a strong showing from the BrightWave team. Twenty-one of our team members signed up to work the event. Michelle Walker quarterbacked the mainline effort getting troops organized along with Liz, Jena and Andy as the core team getting the early pieces in place. At the event itself, there were some pretty notable examples of BrightWavers putting in long hours doing things they didn’t originally sign up to do. For the second consecutive year, BrightWave seemed to be the only team who remembered to bring alcohol. We became the de facto bar for the Home Depot, UPS and other agency teams. Drinks and goodwill were in good supply as we quickly earned the nickname “BrightWave BrightSpot” among weary volunteers 30 hours into a coding binge. If one of our goals was to build a positive reputation amongst our marketing peers, mission accomplished. All in all, it was another great showing by BrightWave in something that did a lot of good. 48in48 will continue to grow. The founders noted that they plan to expand globally next year with the eventual goal of expanding to 48 different cities. 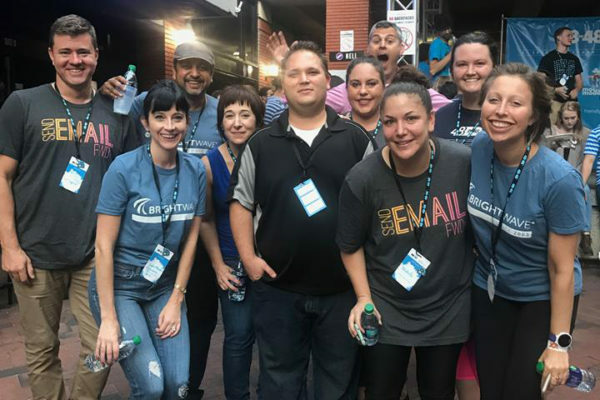 BrightWave has volunteered to be the official email partner of 48in48 and we can’t wait for 48in48 2018!